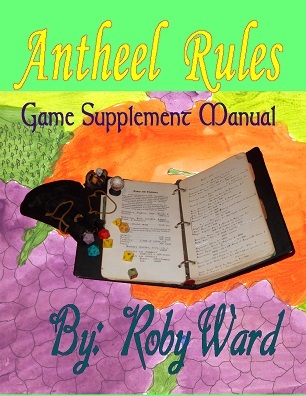 The game Antheel Rules has been present for a number of years now. Finally, the supplement supplying a number of additional rules requested by many has been presented. These rules fully integrate into the standard rules allowing for gamers to expand their scenarios further. Should have this manual in time for Texicon at the end of June. The manual provides most of the information my players have wanted, so should be a wonderful addition. The only other books should be a Monster Manual, but I do not know about that one. I remember creating the cover art, but could not find it. I thus set to work, and I believe this is much better.